Known as the Diver's Paradise, Nethrani Island is decorated with the jewels of coral reefs, full of nesting birds and with incredible fish life bustling around. The island is situated close to a temple town called Murdeshwar in Uttara Kannada in Karnataka state. Murdeshwar is known for its famous 500 year old Shiva temple and the huge statue of Shiva. This largest satutue in the world , over 2000 ft, sits on the hill Kandukagiri and is surrounded by sea on three sides. 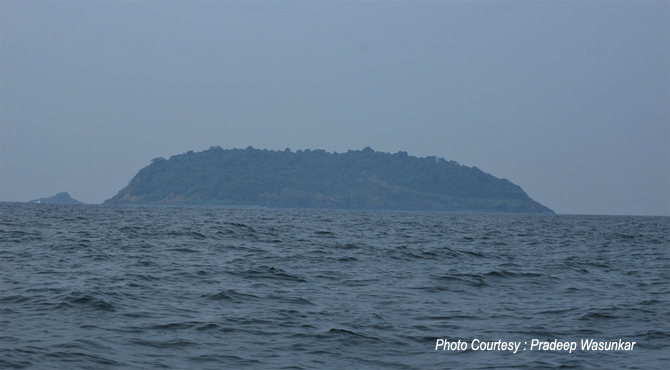 Locally known as Netragudo, Nethrai Island is a place where one can enjoy all the serene beauty of nature. The Island is decorated with Long stretch of silver beach, clear blue water and other natural surroundings. This is one of the best beaches in India which is known for its amazing underwater life. One can see everything from Turtles to Barracuda. This small uninhabited island makes a perfect setting for an adventure yarn. The Island can offer you a kaleidoscope of the underwater life. With depths ranging from 6 to 40 meters and visibility from 15 to 30 meters, divers from every level can experience the wonder of life beneath the waves. The winds, currents and tides makes ones dive more challenging. There are so many popular diving spots in Netrani Island. They are Jenny's Aquarium, Nursery, Grand Central Station, Dinny's delight, The Abyss, Cul de sac, Aladin's cave etc. Divers making it to the Nethrani Island Beach should come well equipped with scuba gear, air tanks and air compressors etc. Among the several diving spots, Jenny's Aquarium is the best diving spots in Nethrani. Even tough the underwater visibility is not that much clear, but one can experience amazing marine life here. The variety of fishes in Jenny's Aquarium is parrotfish, triggerfish, scorpionfish, gobies, yellow shrimp, fusilliers, trevallies and squirrelfish. There is a chance to spot lionfishes and Cobia's resembling sharks. The Nursery has maximum depth 10 meters. The visibility here is great and this diving spot is perfect for beginners as well as advanced divers. It is also a great site for maco photography. The main attraction in this spot is moray eels. This is a good spot to see Parrotfish, triggerfish, scorpionfish, gobies and yellow shrimp. At Grand Central Station, the divers can see a large number of big fishes. When come across a large number of fishes one can begin to understand why it is called the Grand Central Station. Hawksbill turtle are found here. The seascape is littered with Honeycomb morays, Red Snappers, Barracudas, Batfish and needlefish and more. The maximum depth at the Grand Central Station is about 20 metres. The deepest diving spot in Nethrani island is the Abyss which has a maximum depth of 35 meters. This is the favourite spot of deep divers. The gravel bottom has a gradual slope heading towards the island where we complete our safety stop in Dinny's Delight. Dinny's delight is decorated with incredible variety of cowrie shells and multicoloured slugs of various shapes. Angelfish, sergeant majors, wrasse and parrotfish burst in every direction including butterfly fishes and porcupine pufferfish. With Maximum depth of 8 meters this spot acts as the favourite spot.